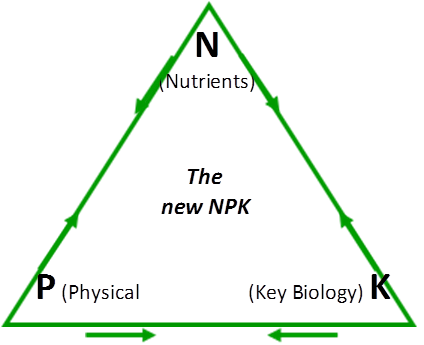 Most people working in soil nutrition understand the term NPK as the measure of Nitrogen, Phosphorus and Potassium in soil or fertilisers. Whilst this has been the way that most soils and fertilisers have been represented for about a century, it only addresses one parameter – Nutrients. Anyone giving more thought to this simplistic portrayal intuitively knows there is more to the story than just Nutrients with it being underpinned by Physical structure and Key microbial or biological lifeforms. This is the new NPK! It is a very powerful and holistic way of envisaging and managing soils, plants and animals by emphasising the direct relationship between these parameters and how they are inextricably connected. The following triangle helps represent how this works, but the practical application of this concept becomes simple and effective when put to use – and the penny drops!